TEC’s seasoned team of software evaluation and selection specialists will be attending the HR Tech Expo in Chicago, October 4–7, the largest HR software and technology event in the U.S.
We’re extremely proud to be partnering up with HR Tech, the biggest HR event of the year. It’s highly recommended for all organizations evaluating or selecting HR software to attend the show and to get the latest news and trends about HR technology. 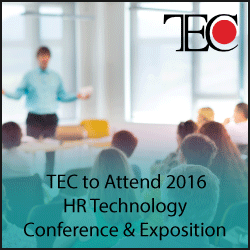 Technology Evaluation Centers (TEC) is pleased to announce its presence at the upcoming HR Technology Conference & Exposition at Chicago’s McCormick Place on October 4–7, 2016. TEC’s team of software selection experts will be onsite at Booth #205 to offer impartial advice on software selection, present its newest Human Capital Management (HCM) Buyer’s Guide, and demo TEC’s patented software decision-making application. HR Tech is the major annual event for human resources (HR) executives and professionals, as well as information technology (IT) executives, managers, and staff involved in selecting, implementing, and supporting HR or HCM software systems and technologies. Attendees are afforded the opportunity to learn about the current trends and future technologies that touch upon this rapidly changing field. The event covers all the latest trends—software as a service (SaaS), the cloud, social, mobile, analytics, video, gamification, big data, and massive open online courses (MOOCs)—as well as the more traditional solutions and technologies. TEC’s team of software selection specialists including Raluca Druta, senior HCM Analyst, and Michael Thaw, director of Software Selection Services will be at the event at Booth #205. The team will present its latest research in the area of HR—TEC’s 2016 HCM Buyer’s Guide: Employee Engagement. The guide examines factors affecting employee engagement, discusses software solutions and capabilities that can help organizations improve their employee engagement strategies, and introduces promising software providers that are developing innovative engagement solutions. TEC will also offer impartial advice and tips on HR software evaluation and selection. The team will also demo TEC’s patented online decision-making support system featuring more than 1,000 leading enterprise solutions on the market, including HCM, core HR, talent acquisition, and talent management software solutions. For more information, read this short post about TEC’s participation at HR Tech. To register for the event, visit the HR Tech Expo website. Once registered, please contact TEC to make an appointment for a personalized, one-on-one demonstration of TEC’s proprietary software decision-making support system at +1 514-954-3665 ext. 404 or online. Now in its 19th year, the HR Technology Conference & Exposition is the annual Town Meeting of thousands of professionals from around the world who gather to share their expertise and challenges in all forms of technology for HR. In addition to senior HR practitioners, every major industry analyst, consultant, blogger, and vendor regularly attends.